The Colour Monster is all about learning about your emotions. Our little green friend is confused at the beginning of the book because he’s filled with so many emotions all at once. So his friend, and our Art Sparks group, help him sort through his feelings, assigning a colour to each one and having a special receptacle to house them. We made climbing monsters to help us reach our jars; we decorated the jars with the different colours for each emotion, filling the jars with what made us happy, what made us sad, angry, scared and calm; we made our monsters, then we sent them off to monster school; we wrote monster letters to our monsters telling them the things that we wanted to be told in school, like study hard, make friends and it’s not okay for teachers to be mean. My current animation show-reel can be found here. My current storyboard show-reel can be found here. More samples of my work can be found at the production blog for my short film Sound Holds the Distance Travelled here. ‘The Melancholic Wife loved to dance…..she danced to cope with the dark and troubled thoughts that lived in her mind’. Take a journey through the inner world of the Melancholic Wife as she struggles against the manifestations of her own personal darkness. Adapted from an original short comic story, this film attempts to convey the everyday, personal glory we carry through the unromantic walls of our real lives. And portray the power of self expression as a means to thrive, grow and survive. A production process blog can be found here. Sound Holds the Distance Travelled began production as part of the BA(Hons) Animation course at Colaiste Dhulaigh, Ireland in conjunction with The University of Wolverhampton, UK. Scene Twenty-Seven pencil test without and with background. Sometimes I think I don’t like myself. A short walk cycle? Okay. Turning on a light switch? Okay. All from a birds-eye view? Sheesh. Capturing the angle was very challenging, the original pencils were close but felt slightly off so I needed to transform the frames digitally with skew and perspective. But it felt right, having a distance at the end, we have observed and we must not forget that we are observers of an autonomous life. The Melancholic Wife is in her power, she does not need us. I asked Sadhbh to make two versions of the background, one with the light turned on, one without. There is a prop to be added as well, a notebook and pen that sit on the table. A gentle zoom into the Melancholic Wife and the notebook will be added in tandem with a fade up to white. Also shadows, I do think I have something against myself! Scene Twenty-Seven digital inks without and with background. Scene Twenty pencil test and digital ink. My first attempted use of motion blur effect on the Melancholic Wife’s arms. Scene Twenty-One pencil test and digital ink. A cycle of eleven drawings shot on threes. Having reached apotheosis through a conquering of the dark the Melancholic Wife is ready to return to the ‘unromantic walls of her real life’. But first she’ll need a doorway and one dutifully manifests from the dissipating energies of her embracing and dancing with the light. The main task of these two scenes was an exercise in special effects animation. The light effects that create the door and the few small sparkles that enter through it in the following scene were all animated directly in Photoshop, no pencilling involved this time. The animation of the door itself appearing will be done using masks in After Effects as will the animation of the door opening, using the corner pin tool. Scene Twenty-Four digital inks and pencil shaded background. The rendering of the background of Scene Twenty-Four was created by Sadhbh Lawlor over an A3 printed copy of the original inks. Sadhbh has a very strong ability in achieving tonal depth with pencilling and I wanted to pursue this style to create a strong contrast with the simple backgrounds of the dream space. The shading also mirrors the shading of the claws which grab the Melancholic Wife, indicating that though they are imagined, they draw their strength from real experiences. The Melancholic Wife has drawn the white light to herself with the aid of her ghost and now comes the first moment of exploration and play. She perceives the boundaries of her form in a new way, we see her twisting her hand, feeling the glow that surrounds her and its flow through the space she inhabits. We follow the arc of her rising hand until it meets its twin. There the gathering energy pushes them apart and she has to find the determination to control the power within her. This scene was heavily influenced by the desire to capture graceful balletic movement, and in part inspired by early reference like the short film Ballet Rotoscope by Masahiko Sato and Euphrates. The Skills Audit and SWOT (Strengths, Weaknesses, Opportunities, Threats) Analysis represented another opportunity to utilise the visual identity elements created for the logo and business card. 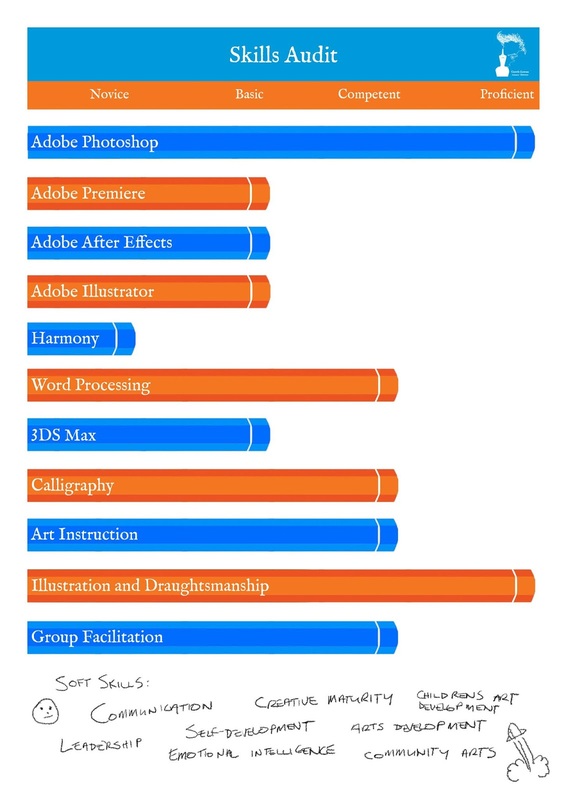 Fot the Skills Audit I decided on going with the pencil motif as a straight comparison to a bar graph. For me it also evokes that sense of pencils falling out of a box. I broke the audit down onto technical / software skills and soft skills gleaned and developed through my years of different creative employment. For the skills that defy a rating scale I included them at the bottom as scribbles to help convey the sometimes informal nature of these elements. For the SWOT I thought of the pen motif and the line coming off as branches into each element of the analysis, vibrant green for strengths, brown for weaknesses, buds for opportunities and thorns for threats. 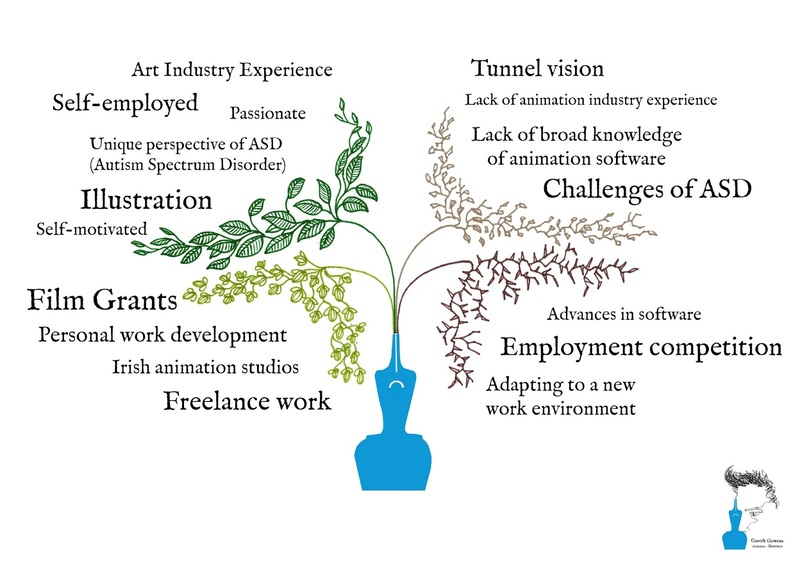 What became clear is that my experience is a tremendous asset to me in terms of creative confidence but that my lack of particular experience in the animation field will be something to stay aware of, especially around technical know how considerations. Scene Eighteen represents something of a breath. There are a sequence of cuts before it between short scenes communicating lots of information and the scenes after it rise up again towards the crescendo of the final dance. So it’s a chance to breath, take a metaphorical pause and have a slow moment to contrast with the quick. The Melancholic Wife’s arms raise steadily, opening up to her power, opening up to the audience. Pencil test alongside digital inks. Animation placed in background. Further animation on the background including the spotlight drawing in, focusing on MW and emanating in a glow around her and a ghost clip will be added in compositing.